Mitch Zimick's hands are a blur, wrapping fishing line from his elbow to his hands into a tight coil, bound for the round, steel crab pot stacked in front of him. Zimick is readying pots for the start of Oregon's most valuable commercial fishery, crabs, accompanied by the sound of Lynyrd Skynyrd blaring from the cab of a nearby pickup. With the right gear, the right conditions and an incredible amount of hard work in some of the world's roughest seas, Zimick could earn as much as $1,000 a day, come December. "It's a gold rush," Zimick said. "We're just hoping for a fair price." Just how much cash he and his fellow deckhands on the Wide West rake in depends on a combination of fairly unpredictable factors, not the least of which is the outcome of the price negotiations under way between processors, crabbers and the arbitrating Oregon Department of Agriculture. 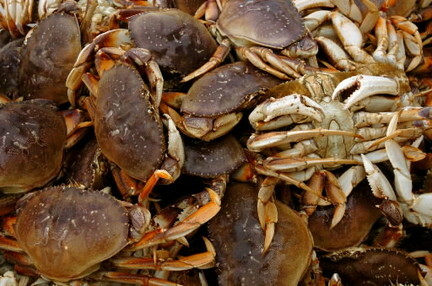 What price the two sides agree on -- and whether they can reach a deal at all -- will ripple out across the state, affecting the size of the crabbers' paychecks, the price retailers can charge in the marketplace and the cost to consumers for a sought-after holiday meal. Last year, the fleet brought in $26 million. Those numbers are affected by a set of conditions, many of which are beyond anyone's control. There's no limit to the amount of 6.25-inch male crabs a fisherman can haul in during the approximately nine-month-long season. But there are only so many crustaceans to be caught and only so many windows of decent weather in which some 350 boats may cross Oregon's treacherous river bars into the ocean. There's also only so much demand amid a struggling economy and a certain amount of supply from last season still on hand, determining distributors' appetite for fresh crab to fill their trucks. First, the good news: This year's crop of crabs tested so far are fat and healthy, which means officials will allow the season to start Dec. 1. If a deal can be reached on an opening price -- last year's opener was $1.60 -- boats will be able to start positioning their crab pots by the end of the month. Florence fisherman Al Pazar said he plans to work a little farther out from shore this year than he normally does, because a spate of low-pressure systems has led to some choppy waters off Oregon. With meteorologists predicting the return of El Nino this winter, Pazar knows it could be rough out there.